Knauf Soundpanel (Soundshield) sound resistant wallboard A heavy duty wallboard for superior acoustic performance. It has a dense high purity gypsum core between two high quality paper liners. The blue, tapered face is suitable for seamless jointing. 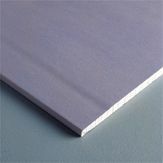 The grey or blue face can be used for the application of gypsum plasters.